Maison Martin Margiela will launch a new duo of fragrances for their Replica capsule line in October: By the Fireplace and Lipstick On. The last duo from the brand was 2014's At the Barber's and Tea Escape. By the Fireplace ~ Inspired by a winter in Chamonix in 1971. The notes include a frosted accord, chestnut and woods. Lipstick On ~ Inspired by Chicago, 1952, at the dressing table, with iris concrete, galbanum, vanilla and tonka bean. 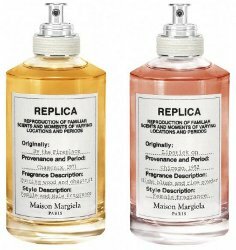 Maison Martin Margiela Replica By the Fireplace and Lipstick On will be available in 100 ml Eau de Toilette. By the Fireplace sounds interesting. I’d love to find a cozy, fireside scent that doesn’t smell like a bag of holiday potpourri from Yankee Candle Co.
Sonoma Scent Studio makes 2 — Fireside & Fireside Intense. And there are others, let me think. So far have not loved any of this series, but I will test them too. Wow, it’s about time someone made a perfume that smells like lipstick!! — besides, of course, Frederic Malle, Guerlain, Dawn Spencer Hurwitz, CB I Hate Perfume — you know. L’Artisan Parfumeur also comes to mind. Just saying. But this is lipstick in Chicago. In 1952. Which is totally different. I don’t know….the Lipstick On may have to go on my sample list. Iris, concrete and vanilla deserve a good sniff!